Windows 10 is Almost Here! This morning I found a tiny icon on my Windows 7 Tool Bar. The official release date is July 29. Now I am wondering how well it will or won’t work with Second Life. This icon is a link to a Microsoft promotional about Windows 10. According to it, you can reserve a copy of Windows 10. I supposed if you haven’t been following Win 10 development you may think this is some great free offer you need to jump on. I have no doubt a large number of people will. Windows 10 is a free upgrade. Microsoft is no longer charging for operating system upgrades. They are following Apple and Google. Both have been giving away their upgrades. The idea is the original purchase and install of an operating system is made by the hardware manufacturer. After that all upgrades are free. When you click the little icon it opens a browser window. There are six small pages of information about Windows 10. 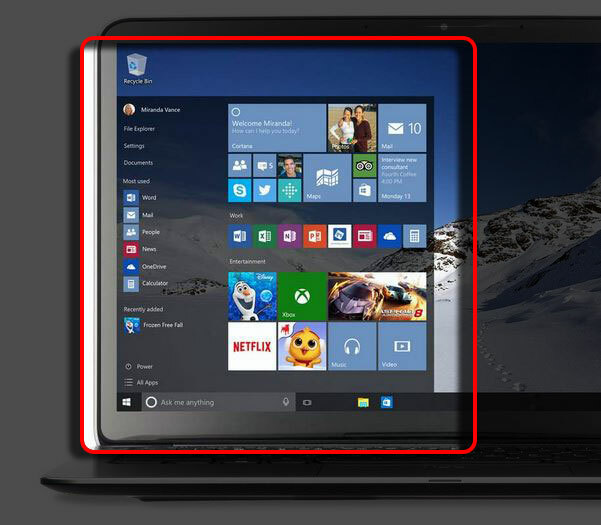 Then a link to the Windows 10 Learn More site. Lots of information there. Of course it is all from the people pushing the product. So, I think some salt is in order. What is different? Well if you hated the Metro Interface in Win8, you’ll be glad to know they have toned down the Metro desktop into something usable. 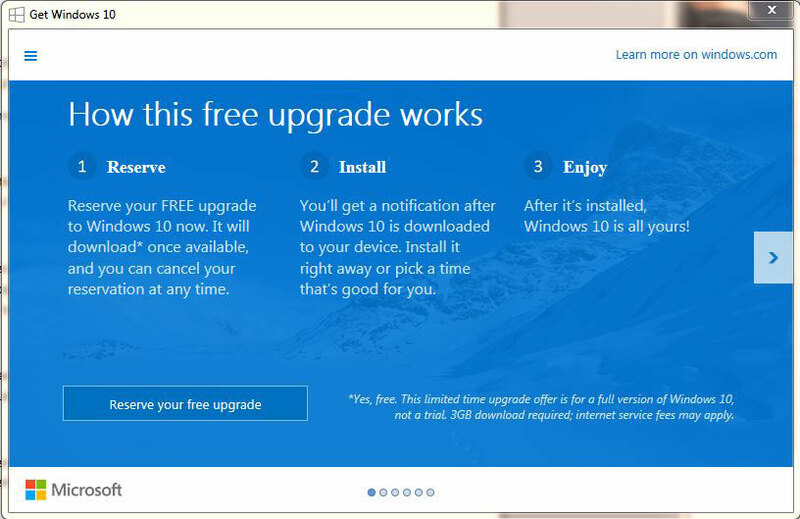 It is probably accurate enough to say the new UI is somewhere between Win7 & 8. Those reviewing Windows 10 are saying it is the new Windows 7. Some think it is the make-or-break version of Windows… right. Like the world is going to change over to Apple? Or Linux? But, this is an important release for Microsoft. Whatever, they have made the interface for mouse and touch users more compatible with each other. I think this is a good thing. I have found that Win8 has been forcing people to actually learn to use windows, I mean the windows not Windows the operating system. Many of my clients work in one full screen window at a time. Almost none know about using Alt-Tab to change between task windows. It looks like Microsoft is trying to get people to use multiple windows. The concept is being pushed as multi-doing… this is the idea of having multiple windows arranged on the desktop so you can work on more than one app at a time. That idea of multi-doing… the term… seems to be dumbing down the whole concept of windows. While I think it feels a little insulting, I realize that after 33 years of windows being a major operating system (1982 first Windows OS), they have to try something to get the idea of windows across. This entry was posted in General Computer Stuff, General News, Second Life and tagged Windows 10. Bookmark the permalink. First thing you need todo with windows 10. Install Classic shell to dump that terrible start menu and replaced it for how a start menu need to look and work. A start menu is not advertising space with free puzzle. I have found the same icon last night. It was quite a surprise. I think the usual term is “multi-tasking”. It’s been there for a while. I installed Windows 10 last night on a lightly-loaded computer I keep for guests which was previously running Windows 8.1 and it took about an hour to update. It preserved all of my programs and settings except an nVidia video driver and Dropbox, which I had to reload. I started up Firestorm Viewer, and it seemed to work fine. My next test will be a Windows 7 computer with a standalone installation of Opensim. As an update to my previous post, I have updated my Windows 7 Diva Distribution Standalone grid computer to Windows 10. Surprisingly, it went even cleaner than the Windows 8.1 update I did earlier. My grid is now running on Windows 10 (Sorry, the grid is not externally accessible due to issues with my DSL modem / firewall). Oh, and I forgot to mention in my previous posts, both of these systems are 64-bit.